Heidi continues her post-surgery and trauma rehab at a local nursing home. She is very determined. She receives OT and PT therapy each day and enjoys visitors to help her through the day. She is getting stronger and improving but still has a long road ahead before she’ll be able to come home, walk, and do other normal life activities. The other day she had 60+ staples removed from her lacerations and surgery incision along with a bunch of stitches removed from her hand and heel. They continue to monitor her to make sure the wounds heal properly, that her circulation is good, pain controlled, and the other basics that go along with this type of trauma and rehab. Megan is recovering at home and trying her best to get back to a routine of school and work as she is able to tolerate it. She is finding new pains in her body as time goes on and the emotional part of the trauma is a daily struggle. We are learning more about how much of a “hero” she was for Heidi following the crash. She’s truly and amazing young woman! I’m doing well but I am exhausted. I try to get to the Y a couple of times during the week and I’m hoping to start meeting with a couple of friends during the week for lunch or coffee as I was used to doing prior to the accident. I’m just starting to get to all the paperwork and administrative nightmares of dealing with the accident. Most of my days include lengthy phone calls, responding to emails, leaving messages, reading mail, navigating medical care for all of us, a lot of driving to visit Heidi and get Megan where she needs to go, and so on. Erin is home from college and working at American Girl in Oshkosh. It’s nice to have her home again. She will be taking some tech classes in 2016 and plans to return to Illinois State in the Fall to resume her Graphic Communications degree. For now she’s going to work and keep up with enough classes that will transfer so she stays on track with her degree program. Andi and Andrew have been able to visit regularly and we just celebrated Andi’s 21st Birthday over the weekend! We are so grateful for our family, including our relatives and extended church friends who are also “family” to us. You have reached out and shown incredible love and generosity to us – we love you all! I’m hoping to get to my long list of thank-you cards to send out soon, your gifts and cards have not been forgotten 🙂 I plan on spending a day with Heidi go through all of them so she can see the love that has been poured out over the past couple of weeks. Thank you again. If you would like to reach Heidi directly please contact me and I’ll provide you with her direct room phone number. I’m posting a couple of pictures of our van, or what’s left of it…they say a picture is worth a thousand words (and I’m way too tired to type a 1000 words right now). 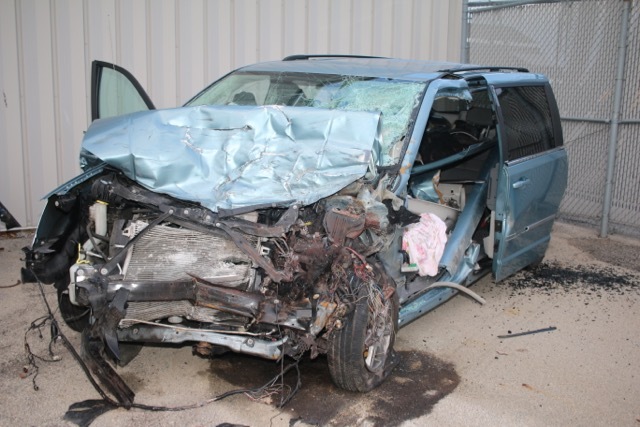 This is what a highway-speed head-on collision does to a 2010 Town & Country. 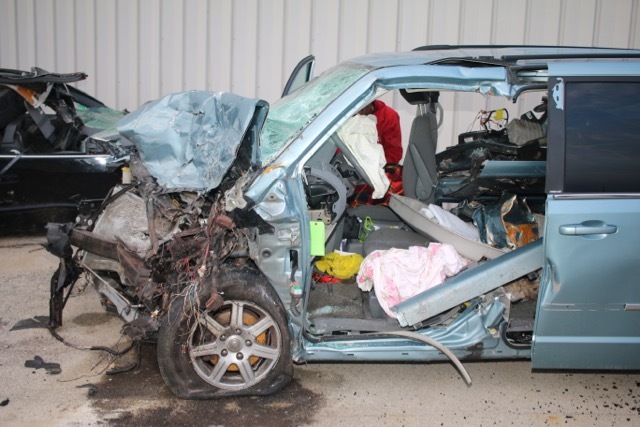 Jaws of life were used to extradite Heidi and Megan, notice the pillar is gone and the back of the driver’s seat removed. Keep looking up to God for help. He will heal Heidi it may take awhile but good the worst did not happen. God was watching over her and Megan and will pray for your family too all the adjustments without Heidi not being there. Thanx for all the updates. Thanks Brian for update. Betty &I will continue to pray for comfort & healing. We are praying for you and your family here at Bethany. God bring healing and strength and help bring healing in all the trauma. You are a good God and we love you. Amen. Praying for comfort and peace for you and the family Brian. I just wrote your mom today to see how things are going. So scary to see that car. So sorry your family has to go through this. I know you have alot of support and all that helps. I pray daily for you all. Will continue to keep you in our prayers.Hope you have a wonderful Christmas.Love to all. Brian, thank you for the updates. Speaking for myself and I suspect for others as well, it is not necessary to write out thank you cards. They are all being sent in love, to help, not to add more burden. Thanking everyone through your updates is thank you enough. Use your time for you, for Heidi and the girls. I am sending my love and prayers to Heidi and to you my friend. I am so grateful to hear about Heidi’s improvement and her determination. Our God as well as your love will keep her focused on that. Please greet her and the girls. Love! Continuing to trust in full recovery for them both. I would love to chat with Heidi, please email me her number at hnokken64@gmail.com. Love to you and Heidi and your girls, Brian! Thank you for the updates, and know that we are praying for you all. I know you have a long road of recovery ahead of you…I pray that you will continually be aware of God’s presence carrying you during this time.